How do we explain the miracle of the multiplication of the loaves and fish? Feeding all those people with such limited food is simply mind-boggling, it almost sounds impossible. There are two ways of trying to explain it. One is to say that Jesus literally miraculously multiplied the loaves and fish such that all five thousand people were fed, with twelve baskets of leftovers. For the Son of the all-powerful God that is certainly not impossible. But could there be another way of understanding the event—one just as plausible and equally amazing and miraculous even if understood a little less literally? Surely all those people who came to hear Jesus brought some food for their journey. They certainly wouldn’t have walked all that way without taking food for their trip. But it may be that none of them wanted to share what he had. 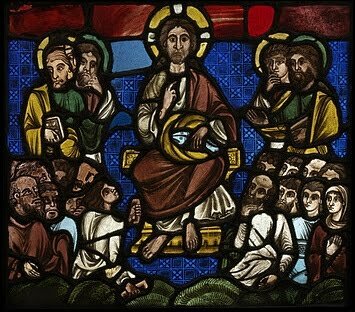 It may therefore be that Jesus, with his ability to draw the best from people, produced the five loaves and fish his disciples gave him, and simply began sharing it with those around him. Perhaps, seeing this, everyone who had something began doing the same, until eventually everyone was sharing what they were earlier hoarding. In the end, there was more than enough for everyone. It may be that this is a miracle in which Jesus was able to change a group selfish people into a community of sharers. It may be that this story represents the biggest miracle of all—one that didn’t only change loaves and fishes, but the hearts of men and women. Whether we understand the story as a literal miracle or a symbolic one, the lesson is the same: when we encounter Jesus, we are always drawn out of ourselves and encouraged to share, not from our excess, but from what we have, however limited this might be at times.